THE BAD: PAIN. I had a good amount of lower back pain pretty much the entire race- I think from sleeping on an uncomfortable bed the night before. I stayed at my Dad's house so I wouldn't have to make a super-early drive to Rockford and he had this weird memory foam stuff on the bed i slept in ( which I initially thought would be nice.) Turns out I couldn't get comfortable all night. At first I thought it was a case of nerves but in the morning I woke up and my lower back was totally scrunched. Oh noes! I didn't want to freak out too much so I just stretched for a good twenty minutes or so and told myself that it would warm up once I started running. THE AWESOME: My friends. They kept showing up again and again and it lifted my spirits each time like you would not believe. I first saw Amy and Emily (who got started driving at 3:45 even though they weren't even racing!) around mile 6. 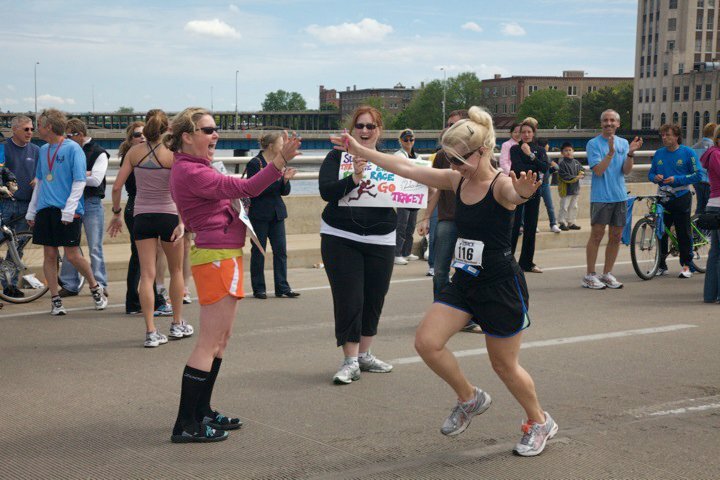 Then whole crew of girls showed up around mile 19 after they all had finished the half. I was pretty sure everyone would head back to the finish at this time but they surprised me by showing up not once, but TWO more times along the course and at one point even flew by me cheering out the window of the car! Plus, Krista and Rochelle jumped in and ran with me for a bit around mile 22 and when I heard about how ALL of them had PRs at the half it raised my spirits like you would not believe. After hearing this I headed into a mile long stretch of wooded trail where I was pretty much alone and I had kind of a rush where I ran with my arms out to the side and felt like I was flying. This was one of the high points of the race. THE PART THAT MAKES IT ALL WORTH IT: I had been thinking about this for miles. (Ok, months. I admit it but I kept visualizing it over and over during the race in order to get me through.) I had a cheesy, inspirational song blaring on my ipod (Melissa Etheridge singing "I Run for LIfe") as I entered the final stretch. I came around the corner and scanned the crowd in the distance until I saw my bright colored signs in the distance again. OMIGOSH. I won't lie, I totally started to cry. It kind of felt like a movie with the sweeping soundtrack blaring as I waved my hands around in the air. If I could have done so at this point I would have leapt, jumped up and down or done some kind of crazy dance. 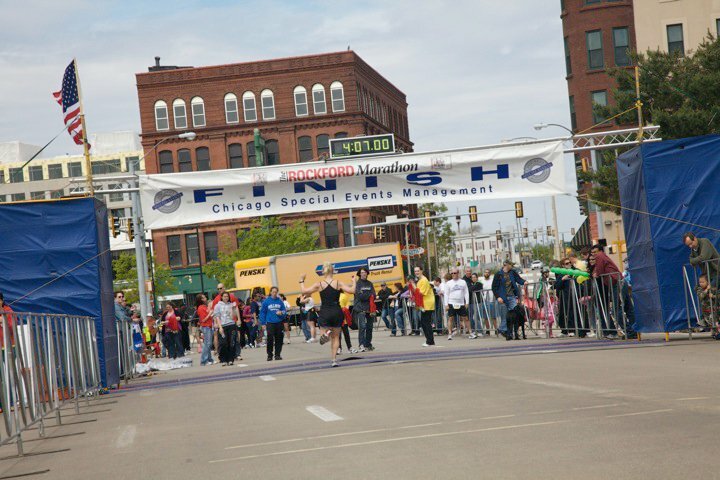 The finish was on a slight downhill so I got a huge burst of energy as I made my way toward the crowd. Whenever I finish a race I feel kind of disoriented by all the people so I didn't get a chance to take in everyone who was there but I do remember deciding to focus on Krista and Amy who were in the middle of the road cheering me on along with RANDOM STRANGE DUDE who joined in on the fun and started screaming my name like a lunatic. Thanks, random strange dude. I high-fived Krista and flew to the finish with a smile so big my face actually was hurting later. On top of my buds being there I also had my husband Jason and our two girls Juliana and Ava, my Dad, my Aunt and Uncle, my brother in-law Dan (who finished in 3:28! ), my sister-in-law, mother-in-law and my three little nieces and a nephew. Whew! I'm going to have a hard time topping this one. Of course, that doesn't mean I won't try. 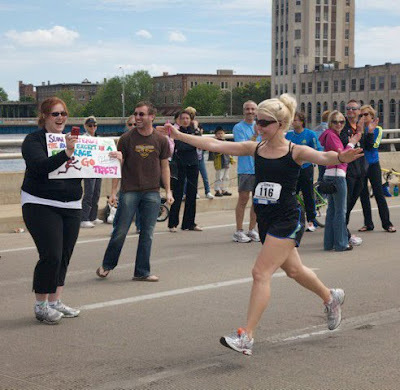 My next goal is to finish the Lakefront Marathon with my group of awesome ladies who totally rock my world like you would not believe. Everything I'm doing now is so different from where I was even a couple of years ago and I am so, so grateful. I always say that marathon running is similar to childbirth in that you are so elated with the result that you forget all the pain you had to endure and you tell yourself it would be an awesome thing to do again. Look how happy Krista is to see me!